Perfect for 'pushing' people around. Composed in the early 90s, the "Tai Chi Magic" theme song has been the background music of over one hundred stage shows, tournaments, and government exhibitions. 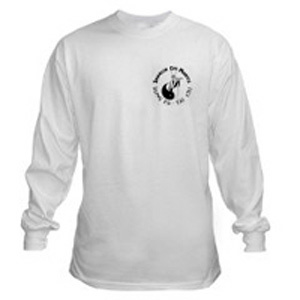 Performing the Shaolin Chi Mantis Yang Style Tai Chi Short Form, the SCM Demo Team would start and end at the same time together, using the music of the song, "Tai Chi Magic," to keep them syncrhonized and flowing together at the same pace. 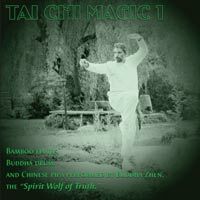 The original 4-track recording of "Tai Chi Magic" is featured in the early Zen Buddhist Podcasts by Buddha Zhen. 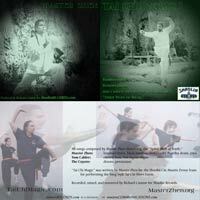 Left graphic = 4-panel CD cover of Tai Chi Magic 1. 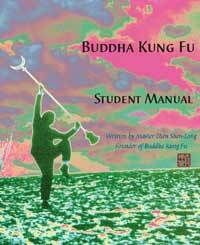 The song, "Tai Chi Magic," was composed for the Shaolin Chi Mantis Demo Team in 1993 by Buddha Zhen. Get the ENTIRE ALBUM below which includes, "In The Pool Of Enlightenment," a 13-minute Zen classic. All songs composed by Buddha Zhen. November, 2007. Shaolin Records / Coyote Studio 2, Tujunga, California. 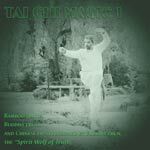 TAI CHI MAGIC recording sessions completed with assistance from American Zen. 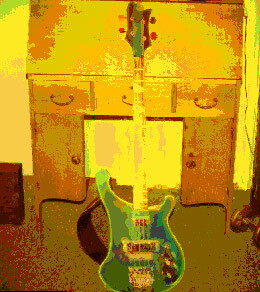 Tom Calder's Rickenbacker bass added a foundation to some songs just as Buddha Zhen teaches his students to have strong stable stances. Kung Fu bass? Steve Hixon had volunteered to play drums but his working schedule didn't coordinate with us. Those who've been following the American Zen stories, "LEVELS," know that Steve Hixon joined the Coast Guard when Coyote was in Utah. Coyote got his first drum set two Valentine's Days ago. "I'm barely professional," chuckles Coyote. "This album gave me a chance to pursue my inner drummer -- or caveman. There are only two spots on the album where I was playing a rock'n'roll drum beat. I was trying to create this Asian, primitive, human, kinda thing." This turned out to be Coyote's first album as drummer. "I've played percussion on dozens of records," says Coyote, "but this was my first album as a drummer and the first time my drums ever were recorded." Coyote loves his Pacific Drum set from Drum Works, but -- they were the cheapest set they had at Guitar Center. "I fell in love with them the moment I saw them," pants Coyote. Over the next months Coyote added and built his drum set into a mismatch of what his buddies at Guitar Center advised him were the best mid priced choices. "A neighbor gave me pieces of his old Ludwig set. I just kept upgrading until I had professional parts everywhere, on the cheapest drum set I could buy." Coyote's Pacific Drum set includes a Ziljian Scimatar Ride Cymbal donated by a neighbor, DW500 Kick Drum Pedal, Coyote's newest girlfriend, his Iron Cobra High Hat with Sabian Cybals with etched ring layers. Notice how it blends with the splash cymbal Coyote picked up without a name on it. "Sometimes low price can have great quality," smiles Coyote. "I'm still learning from my mistakes and victories," explains our hippie Coyote. "On the Buddha Zhen album I was using the drumheads recommended to me... and then realized that most people don't understand MY musical visions -- until they hear them. Buddha Zhen's album has double thick Emperor heads on the drums and an Evans head on the snare. Where most drummers like the dull, non ringing, sharp and quick sounds -- I prefer the unwieldy ringing of large drums, double headed and usually tuned different on each head so each drum sounds like two drums. By the time I finish my next album for American Zen -- I'll have my drum set down. I hope you enjoy what I did on this album. I really had fun. I hope you like my impromptu singing on "INNER WILL." I kept getting lost as to where I was in the song, so I figured I'd try singing my little BUDDHA KUNG FU CHANT. It was an impromptu thing with two lyric lines? I didn't have a microphone to sing into. I was just singing and playing with the two stereo micropohones about 6 feet in front of the drums."